Our twisting, spiraling journey across the British Isles was our experiment in living by kairomancy. Robert Moss, in his book Sidewalk Oracles, defines kairomancy as “divination by special moments” or “making magic by seizing those special moments” (p. 49). At each step of the way we sought guidance from our “guides,” first from Elen of the Ways in Wales, then from WB Yeats in Ireland, and finally from Elen of the Ways again when we returned to Orkney. The techniques we employed included dreams, visions, meditations, paying attention to seemingly random events around us (sidewalk tarot), and a muscle-testing technique called applied kinesiology. For years we have been using muscle testing routinely in making decisions ranging from which product to buy in the supermarket to where and how we should travel. When we said “yes” to following Elen of the Ways, we determined that we would make the journey an experiment in kairomancy. While the process did not necessarily result in life-changing experiences, I can report that this journey was more meaningful than many carefully planned trips we have made in the past. But, at this point, we found ourselves exhausted and uncertain. We were back in Wales, where we had started. What next? Guidance was silent. Had we gone astray by cancelling the Isle of Man? Were we deluding ourselves with all this kairomantic mumbo jumbo? Or were we simply bone tired after nearly a month on the road? One thing was clear. We were not in any condition to think about the next step. We needed to take care of our aging bodies and get some rest. After unsuccessfully trying to schedule massages at two local spas, we found ourselves standing on the sidewalk in Cardiff wondering where to try next. A local man offered us a map and pointed towards a market arcade just ahead. He said, “Go with the flow! You are on vacation!” We chose his comment as our “sidewalk tarot” for the day and walked into the arcade. There we found a shop called “Simply Bare,” which looked like a body waxing place. We enquired about their other services and scheduled much needed massages for the following afternoon. Round houses at St Fagan's Folk Life Museum. Sidewalk tarot is a term invented by Robert Moss. We chose to take the comment “Go with the flow!” as significant, but we could have chosen another one of the thousands of stimuli flooding our perceptions and acted on it. Choosing one event or image to be our sidewalk tarot is a conscious act. Stimuli don’t arrive with a large sign— “PAY ATTENTION TO THIS”—attached. We were making choices all the time about what input we filtered out and what we concentrated on. Our choices were guided by intuition. We have found that choosing to pay attention to seemingly random events tends to pay off for us. Next morning we visited the nearby St Fagan’s Folk Life Museum, an outdoor museum/living history park with reconstructed Iron Age roundhouses and other historic buildings. The exhibits were interesting, but the sidewalk tarot we noticed was a tree in the forest that looked like Elen of the Ways, complete with antlers. 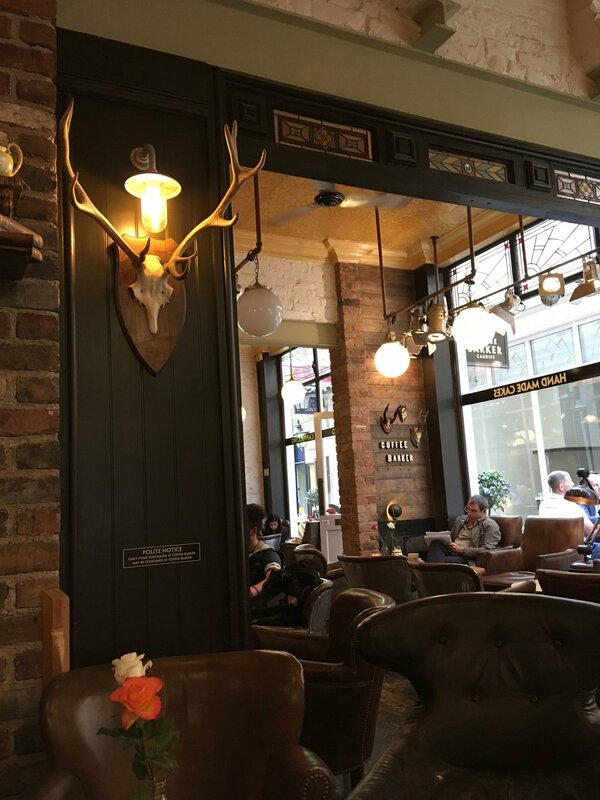 As if that was not enough, when we returned to Cardiff we stopped in a coffee shop and sat down at a table under a set of deer antlers. We joked that Elen of the Ways was making sure we knew that she was still with us. That afternoon while waiting for our massages, Elyn opened a Welsh wedding magazine in the waiting room and saw an article about St. David’s. We chose that as our sidewalk tarot leading us to our next destination: St. David’s—a town on the west coast of Wales. 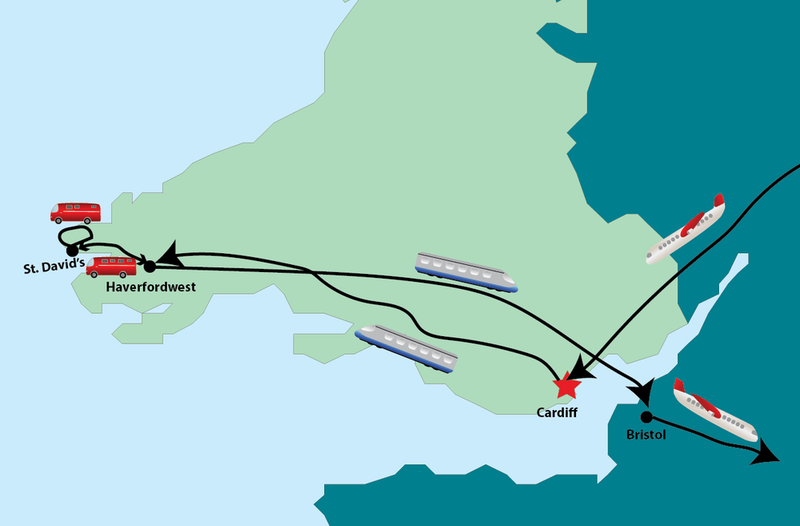 We checked and found that we could travel as far as Haverfordwest by train, and then take a bus from there to St. David’s. 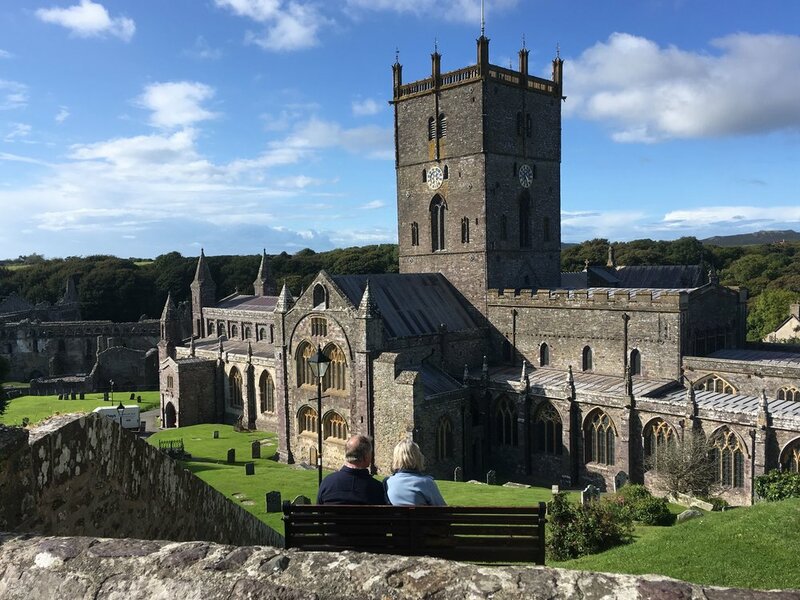 We had visited St. David’s when we were doing research for our book Powerful Places in Wales. It was a nice little town with a big cathedral and a once-pagan holy well dedicated to St. Non, St. David’s mother. But we wondered why we were directed there again. We walked around town looking for “signs.” The former mayor of St. David’s, who is the owner of the bookstore near the cathedral, informed us that that evening there would be a special musical celebration for the retirement of the bishop. We visited the cathedral for evensong and were treated to a huge, theatrical musical evening with a large choir and the cathedral organ pumping out ruffles and flourishes. For me, a long-retired music professor, the lavish performance seemed like a gift for my faithful service to our oracles. On the way home with our newly expanded fuzzy kid family. Our walkabout completed, we returned to Bristol, England, where we took a nonstop flight back to our home in Girona, Catalonia. 1. Kairomancy works at least as well as careful planning and often puts us in places where we have meaningful experiences. 2. Doing a walkabout is much more expensive than a planned trip because of changes in plans and last-minute booking. 3. Doing a walkabout challenged my long-standing need to be “in charge” and know where I am going. 4. We are never “in charge.” We just think we are. 5. We never know where we are going. We just think we do. 6. There is guidance if you are willing to get out of the way, let go of your preconceived notions, and learn to listen. 7. By saying "yes" to Elen of the Ways I was saying "yes" to life and adventure.